I sit on the window seat of the bay window in my study, watching the day disappearing over the magic forest in the near distance. I don’t usually sit here, but I have the windows open allowing the soft evening air to wash over me as I smoke a bowl of Dark Dwarf. My thoughts—drifting away with the smoke—swirl about the three soldiers of The Devil and His Grandmother. 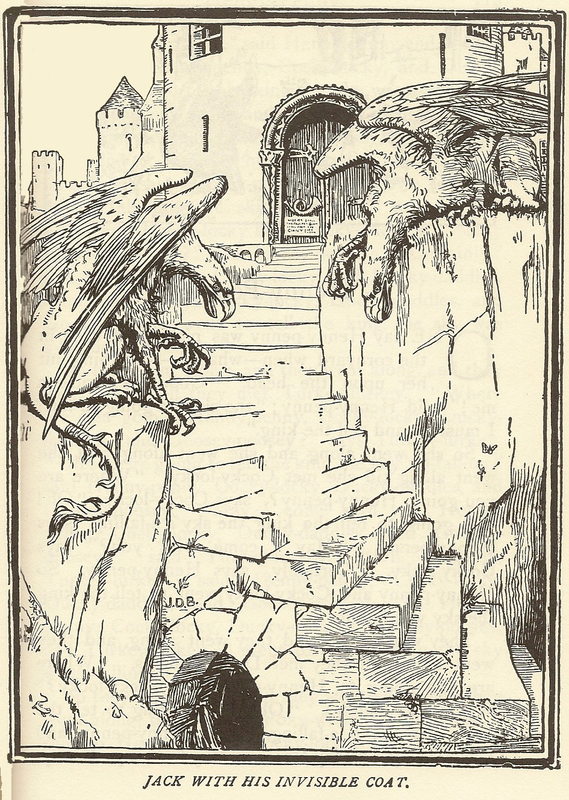 While I can’t call the three soldiers a motif, the trio shows up in more than one Grimm story. To my thoughts comes The Three Army Surgeons, The Long Nose, and The Crows—although in this last one the three are not companionable. 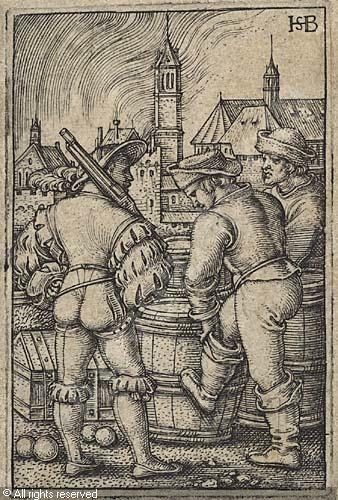 Outside of Grimm I can think of The Three Soldiers in Jacobs’ Europa’s Fairy Book, and the well-known Stone Soup. I am sure with a quick search I can find another. Stephen Badman’s Odds and Sods sits atop a pile of books near me. I grab it and page through. Sure enough, I find The Three Rowan Trees. Three soldiers are dismissed from service with little to show for their time. They agree to travel together and stumble across an empty castle in which all their needs are mysteriously met. That evening, to the soldier named Hans, comes a snake that crawls into his bed and turns into a princess. She explains to Hans that she and her sisters are the three rowan trees growing in the garden. If Hans and his companions will bear being whipped all night long for three nights starting at Midsummer’s Night, the spell will be broken. Hans agrees to try. In the morning he visits the rowan trees and is given three magical gifts: a purse that never empties, a cloak that will take him anywhere, and a bag that contains an army. Immediately forgetting his promise, he and his companions travel to London via the cloak and Hans pursues the hand of the daughter of the King of England. She cheats him out of the magical gifts and abandons him. He is close to suicide when he comes across a tree of golden apples that cause a horn to grow out of one’s forehead, and a golden pear tree that removes it. Tricking the king, queen, and princess into eating the apples, they are beholden to him to have the horns removed. Thus he regains the magical gifts. He uses the bag containing the army to release his companions who have gotten themselves into trouble, and returns to the castle by Midsummer’s Night. By keeping himself and his companions drunk for the next three days and nights, they survive the whippings and break the spell. Each marries a princess and Hans becomes king. What is it about a trio of soldiers gallivanting around the countryside that engages the listener? Hans is the protagonist, but the other two companions are not completely necessary for the story. A teller could easily edit them out. Yet time and again a trio like this appears to populate a ribald tale. I hear Thalia padding down the hall. For the moment, this puts an end to my reflections. After reading to Thalia, I return to my window seat and my pipe. The gentle evening air comes from the direction of the magic forest carrying with it the touch of enchantment. It has a hold on me and my wandering thoughts. Oddly, Thalia asked me to read The Long Nose to her. It is a variant of The Three Rowan Trees; at least the element of a fruit tree causing disfigurement and another to cure it is in both, along with the soldier trio. While these two stories bear a resemblance to Jacobs’ The Three Soldiers, there is no one tale type that can be attached to the appearance of three soldiers. Nor are these soldiers the only trio in the tales. 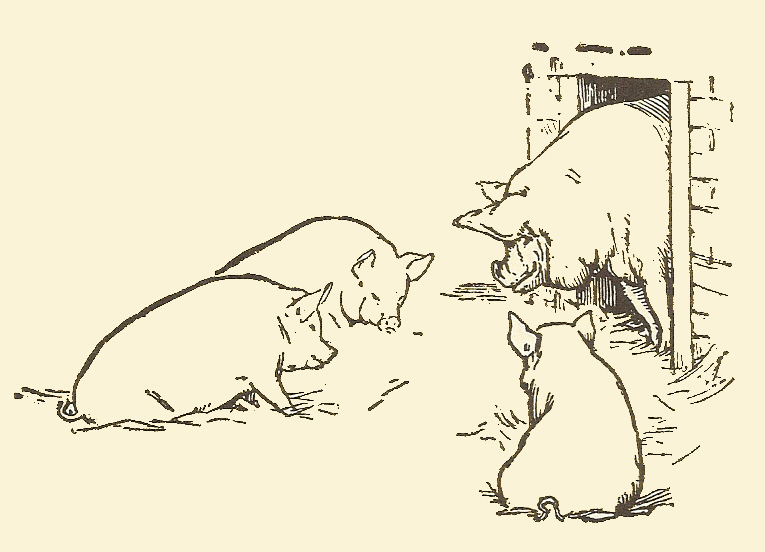 From The Three Little Pigs to The Three Feathers we have other examples. I discern patterns with these threesomes, whether they be pigs, brothers, or comrades. In the case of the pigs, the first and second were failures, while the third succeeded. When the trio is made up of brothers there is a hierarchy of age with the youngest appearing to be the least promising. In truth, the elder two have their shortcomings, while the youngest has what it takes to overcome hardships. The pattern for the comrades is a little different. In the soldier stories the comrades are of equal status. Even in The Three Soldiers, where a sergeant, a corporal, and a private travel together, the sergeant never pulls rank on the other two. All decisions are made upon agreement. I peer at the magic forest’s silhouetted tree line. Have I thought this through or is there another aspect? In all three examples (pigs, brothers, and comrades) the lesser two members of the triad are a counterpoint to the nature of the third, who has become the protagonist. Hans, of The Three Rowan Trees, is an opportunist. It is Hans who suggests they all stick together. It is he who chooses the road they travel. Hans converses with the snake and a rowan tree. Hans pursues the princess in London. His companions almost wordlessly go along with him. The most they do is spend all their money and get into trouble, relying on Hans to get them out of their predicament. The companion’s lack of activity contrasts with Hans’ constant motion. Watching my pipe smoke drifting along on the night air, my thoughts drift toward one more aspect. The three soldiers offer up the chance for roguery. Hans’ conduct is not exactly exemplary. He clearly “slept” with a princess, and after receiving magical gifts from her, pursues yet another princess. Later, he uses trickery to get back the gifts he carelessly gave away. When he returns to the rowan trees (and just in the nick of time) to do the right thing, he does it by getting his comrades so drunk they don’t know they are being mysteriously whipped all night long. “There is a fairy in my bookstore!” Melissa’s eyes are wide with concern. She didn’t even say hello when I entered the shop. She fairly slammed her book down. “There really is a fairy in my bookstore?” Melissa’s alarm is slipping toward wonderment. “She has black, static-filled hair?” I prompt. Melissa moves her hands about her head in imitation of the fairy’s floating locks. “Consider her a magical gift,” I say. “Rather like. Yes,” I say. Actually, not, as I think about it. The magical gifts are inanimate objects imbued with magic. The fairy is alive and entirely a creature of the fey. And where do the magical gifts come from? Who made them? In The Three Rowan Treesthe gifts of the magic purse, cloak, and bag are given by the enchanted rowan tree. Do the gifts fall from the branches like fruit? We are not told. Sometimes in the fairy tales, the gifts are not objects, but rather attributes or events. A heroine may be given the gift of flowers falling from her lips when she speaks; she may grow more beautiful every day; or her destiny maybe to marry a prince. These are blessings granted at the moment of their uttering. But we get the sense that the magical objects preexist their being granted to the hero or heroine. The gifts of attributes and events are more a reflection of the hero or heroine’s worthiness. These are more often conferred upon women, and not always to their benefit. Sleeping Beauty was one such recipient. “What do you feed fairies?” Melissa jolts me away from my still-wandering thoughts. “Really.” Melissa grabs a pen and paper. We return to our everyday world of mundane concerns, but our fairy, out of sight, flutters about the edges of our normality, and perhaps nibbles on it.